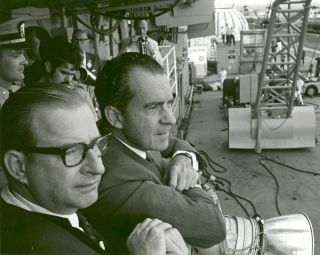 President Nixon and Dr. Paine wait for the Apollo 11 astronauts to return. In this historical photo from the U.S. space agency, President Richard M. Nixon and Dr. Thomas O. Paine, NASA Administrator, watch Apollo 11 astronauts Neil A. Armstrong, Michael Collins and Buzz Aldrin Jr., walk from the recovery helicopter to the Mobile Quarantine Facility aboard the U.S.S. Hornet. The President later congratulated the astronauts on July 24, 1969, by microphone, speaking through a window of the quarantine trailer. During the eight-day space mission, Armstrong and Aldrin explored the Moon's surface and brought back rock samples for scientists to study. Collins piloted the command module in the lunar orbit during their 22-hour stay on the moon. The extravehicular activity lasted more than two hours.